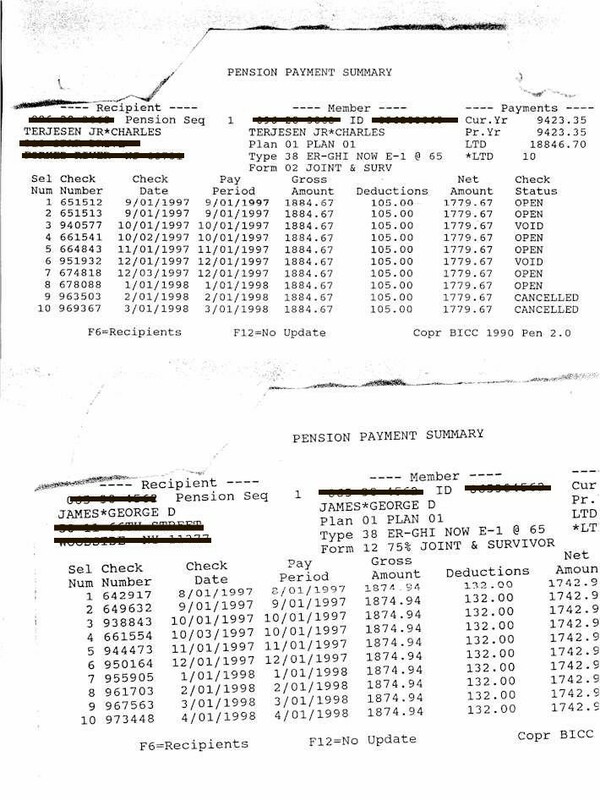 Former Dockbuilder President/Business Manager Charles Terjesen Jr. and former Financial Secretary/Business Agent George James both received their "field" pensions for one full year while still working at salaried Union positions ,(see printout below) as part of the McCarron "buy out" package. Both also retired two full years before their terms ended with the election of Peter Thomassen president on July 1st 1998, thus avoiding a deep salary cut , upon which their pensions are based. It is no surprise that these two Officers sold out their members. They had been placed in Office by Fred Devine, and both were his biggest cheerleaders; right up until the nano-second that McCarron removed Devine from office. Then, both could not desert Devines "sinking ship" fast enough. They quickly found dry accommodations aboard the S.S. McCarron. McCarrons involvement in this is no surprise either. It is typical of his "buy and sell" mentality . He buys the loyalty of weak officials; he sells out the rank and file. These loyalty purchasing "buyouts", probably fall within "legal" boundaries. BUT, they are certainly not ethical, and they prove that none of those involved, McCarron above all, have the slightest clue as to the meaning of UNION.